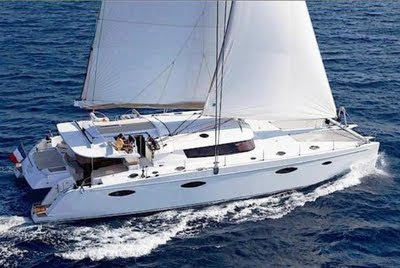 2010 Luxury Catamaran World's End - available for charter in the Caribbean. There is no better place to sail then the Caribbean, with it's magnificent and unspoiled beaches, it's wonderful nature and tropical climate. Imagine swimming, snorkeling and diving in the world's top diving and snorkeling spots with a vast array of colorful tropical fish at every anchorage; or walking beaches where there are no foot prints. ‘World's End’ explores the quiet coves - where Columbus used to anchor - in search of total relaxation, far away from the modern world, and still offering 5 star luxury and excellent cooking on board or on those dream beaches. Since the Caribbean does not experience significant seasonal changes, weather conditions and temperature are fairly consistent all year round.Every island has it's own characteristics, from very sophisticated to pure and overwhelming nature. Tell us what you want to experience and we will take you there. Our excellent staff and crew will make every effort to see your dreams come true and to make this voyage the finest and safest yacht experience ever. WORLD'S END can accommodate 10 guests in 5 cabins. The Master cabin has a double bed, shower and toilet. 3 Guest cabins have a double bed, shower and toilet. A Guest cabin has a twin bed, shower and toilet. WORLD'S END is fully air conditioned through out. This is a non-smoking vessel. WORLD'S END´s crew has a separate heads and shower. Guests are not allowed to bring pets onboard.